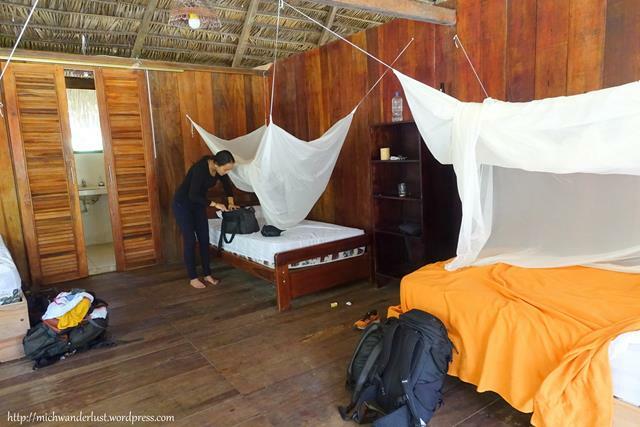 Which is the best Amazon jungle lodge in Ecuador for you? Thinking about visiting the Ecuadorean Amazon but feeling overwhelmed by the plethora of choices out there? 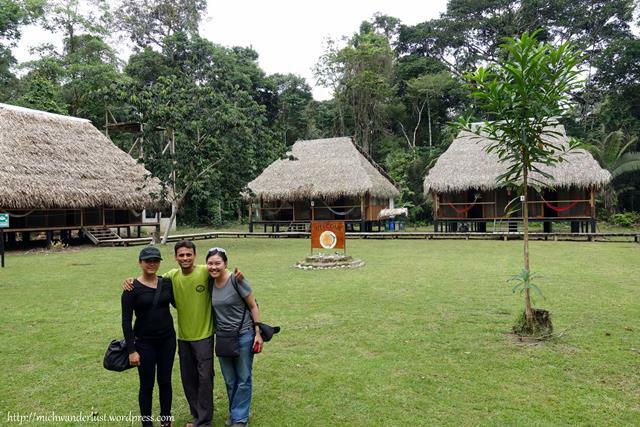 How on earth, you may be thinking, are you supposed to know which is the best Amazon jungle lodge in Ecuador for you?? 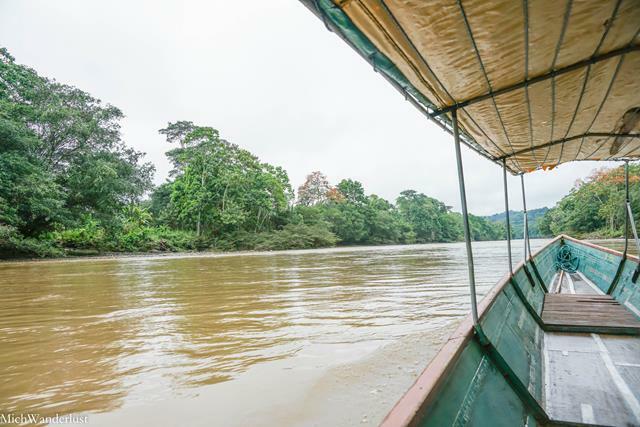 Well, good news – I’ve teamed up with a fellow travel blogger, Nicole from Go Far Grow Close, to bring you a comparison of 3 popular Amazon jungle lodges in Ecuador! 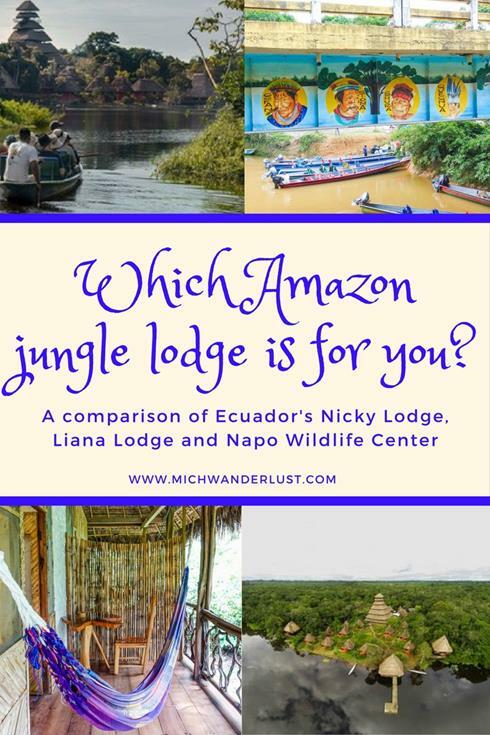 I visited Nicky Lodge (one of the most affordable options) and Liana Lodge (just a tad more expensive), while Nicole visited Napo Wildlife Center, a luxury ecolodge. So read on for a detailed comparison of Nicky Lodge vs Liana Lodge vs Napo Wildlife Center. Located in Cuyabeno Nature Reserve east of Quito, Nicky Lodge isn’t difficult to get to, although it will take you the better part of a day. You will need to get yourself from Quito to Lago Agrio, either by plane, public bus or private bus. The lodge can help with private bus arrangements, but this is excluded from the tour price. My private bus cost USD40 for the round-trip, while you can take a public bus for about USD10 one-way from Quitumbe Terminal. The private bus called at a number of stops around Quito though, so it was much more convenient. The bus ride from Quito to Lago Agrio takes about 8 hours. There, you get picked up and driven another 1h 45min to the Cuyabeno Bridge. Here, we took a short break, and had lunch and a quick briefing. From there, it was a 3-hour canoe ride to the lodge. Along the way, our guide pointed out various wildlife and plants endemic to this region. For more details about my journey from Quito to Nicky Lodge, click here. This is the most accessible of the 3 lodges. All you have to do is catch a bus to Tena (4 hours from Baños, 5 hours from Quito), take a local bus to Puerto Barantilla (about 1.5h), and then hop onto the waiting canoe for a short 5-min ride to the lodge. You do have to make your own way to Puerto Barantilla, however. Cost-wise, public buses in Ecuador are cheap. The Quito-Tena bus should cost about $5, and the Tena-Puerto Barantilla bus cost $2.40 (as of March 2017). Just make sure the bus conductor tells you when you reach Puerto Barantilla, as it’s not the end of the line! For more details about how to get from Tena to Liana Lodge, click here. Nicole from Go Far Grow Close says: “Getting to Napo Wildlife Centre was an adventure in and of itself. We took a short 30-minute flight from Quito to Coca. There, we were picked up and driven around 10 minutes to Napo River by representatives of our lodge. 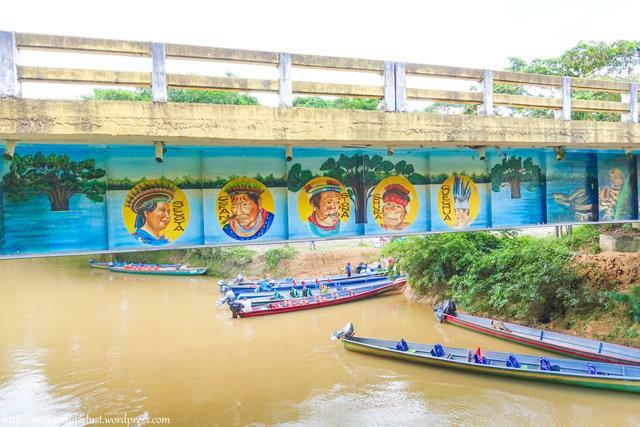 We climbed into a long speed boat and sped along the river for around 2 hours. Liana Lodge is the most accessible, but also involved the greatest amount of independent travel. If you’re short on time but are comfortable with public transport, this might be the option for you. On the other end of the spectrum, Napo Wildlife Center provides a hassle-free and relatively quick journey all the way from Quito. And if you’re on a budget but can afford to spend almost a day in transit, Nicky Lodge is a great option. Nicky Lodge offers a fixed itinerary which is fairly packed. Days start at 6.30am and end around 8 or 9pm, although you do get a couple of hours off for your afternoon siesta. The standard tour is 4 days and 3 nights, which means 2 full days there. The first full day involves canoe rides and jungle walks, while the second includes a visit to an indigenous community. If you’re the kind of traveller who doesn’t like to cram too much into one day, this might feel a bit much, but you will definitely learn a LOT. Of course, you can always choose to stay in or do something else. On my last night there, many people skipped the night walk, having had enough of giant spiders! Liana Lodge is pretty much the complete opposite – it’s a “choose your own adventure” kind of place. They have a list of activities that you can choose from, and you just have to book it with the front desk the day before. Over to Nicole: “The standard itinerary is the 4 day/3 night Premium Tour which is a fixed itinerary. Each day started around 5:00 am. One day, we had a full day tour away from the Lodge. We returned by dinner, and afterwards, a night jungle walk was offered. On another day, our tours were centred close to the Lodge, so people could choose to opt in or out of certain activities. However, another full day of activities were offered. If you’re looking for a relaxed time with no pressure to wake up at the crack of down, I recommend checking out Liana Lodge. If you’re looking for a more structured itinerary with plenty of activities to keep you occupied, Nicky Lodge and Napo Wildlife Center are great. We enjoyed multiple canoe excursions, which meant getting up at 6am as wildlife tend to be most active at dawn and at dusk. Yes, it’s a pain to drag yourself out of bed. But by the time you’re floating along trying to make out whatever your guide is pointing at, all sleepiness will be gone. And don’t miss the sunset canoe ride! 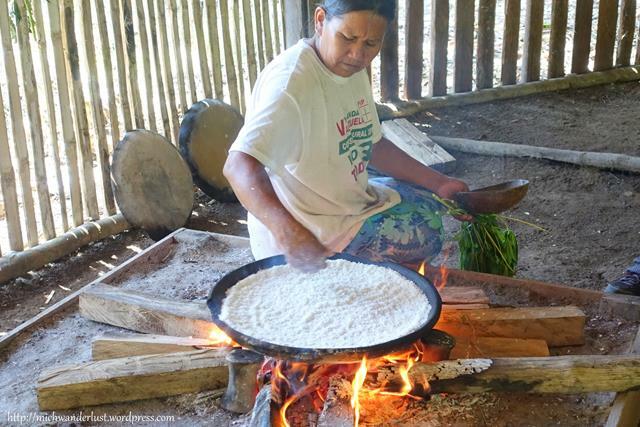 We also went on jungle walks and visited an indigenous Siona community, where we made yuca (cassava) bread. As mentioned above, the lodge has a list of activities you can choose from. These include a number of jungle hikes, a visit to the Amazoonico animal rescue centre, building a raft, and visiting a local Kichwa family. You can see the full list here. We only stayed 2 nights (i.e. 1 full day of activities), so we just did a hike and visited Amazoonico. It would’ve been nice to try some of the other activities they had on offer, though! What say you, Nicole? “At all times, we had our own naturalist guide, oarsmen, and a wildlife spotter. Most of the activities centred on paddling in canoes among the various creeks, rivers and lakes looking for wildlife. 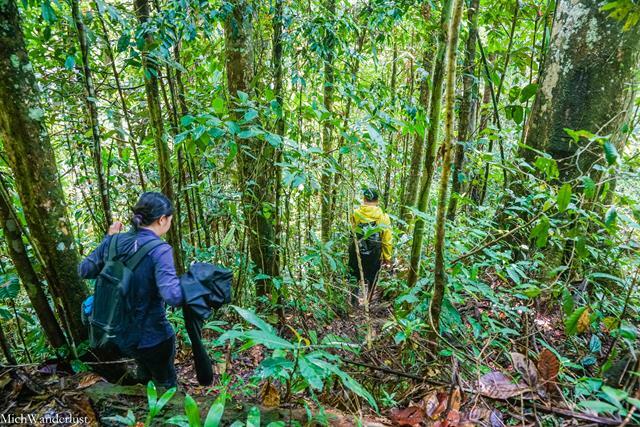 However, day and night hikes were also offered in the jungle. We spent a morning on top of a 140 ft tower, allowing us to watch birds fly, nest, play and eat over the top of the rainforest canopy. It would have been impossible to see this from the ground. 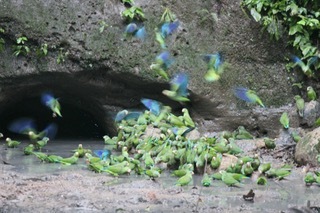 We visited two separate clay licks and watched hundreds of parrots in their feeding ritual. In terms of variety of activities, Napo Wildlife Center and Nicky Lodge seem to win out. 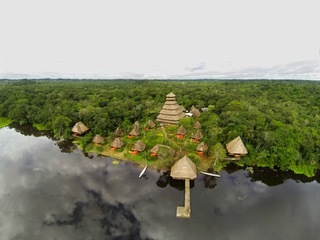 Note though that the former is located in Yasuni National Park, one of the most biodiverse areas in the world, so wildlife spotting opportunities are probably greater – like the clay licks! Think clean, basic accommodation. My room slept 4 people, though the website says they have single, double and triple accommodation. Each bed has a mosquito net, which was awesome. Each room had a hammock outside, which meant that there was quite a bit of competition. But better than nothing, right? In the lobby/lounge area, you’ll find some games, books and (most memorably) a chess board. Also, the bar offers extremely cheap beer – much cheaper than anything you can get in Quito! Here, the ambiance is more luxurious. The spacious lounge and dining area immediately makes you feel like you could chill out there all day. I didn’t see any books or games lying around, though their website says that they offer board games. But I did see a guitar! There are 12 standard cabins (double or triple) and 8 suites. They also have 24/7 electricity, something that neither Nicky Lodge nor Liana Lodge has. No taking showers by candlelight here! Nicole from GFGC: “Accommodation was luxurious and stunning. We had two bungalows for our family of five that perched over the lake. There was an enormous ecological tower that housed a beautiful dining hall, lounge, store, library, meeting centre, and a 130ft observation point at its peak. 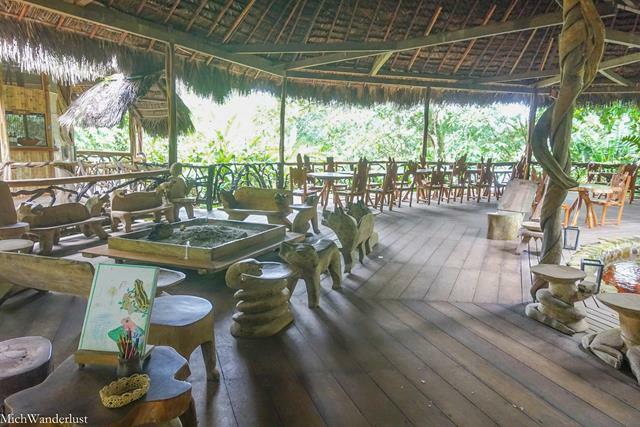 There is naturally a difference between a luxury ecolodge such as Napo Wildlife Center and more budget options. As you would expect, you get what you pay for, but Nicky Lodge’s and Liana Lodge’s facilities are more than acceptable. They work with local communities and bring them income by organising visits. You’ll get to tour their plantations and make yuca bread (see Itinerary, above). 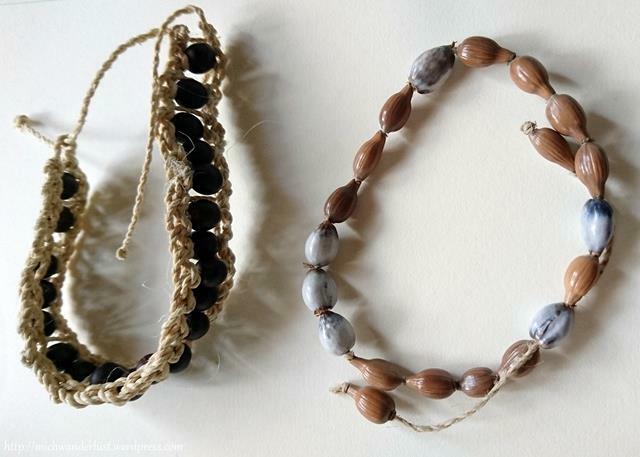 The villagers also lay out handmade bracelets for sale (all materials sourced locally), but you feel zero pressure to buy. Each only costs around $2-3. Bring small change when you go! Liana Lodge is owned by a Swiss co-operative, which also owns the animal rescue center AmaZOOnico and a large swath of rainforest that’s particularly endangered by deforestation. The co-op’s objectives include helping the local Ahuano community implement sustainable rainforest management, and preserving the rainforest. They also employ Ahuano people at the lodge and organise visits to Ahuano families, where visitors can learn more about Kichwa culture. Nicole: “This was one of my favourite parts of Napo Wildlife Center. All the employees were from the Kichwa Anangu tribe, who own the land. They rotate working at the Lodge, each contributing to a luxurious five star experience. The tribe has given up hunting on their land in exchange for the success of the Lodge. The itinerary also includes spending time in their community learning about their history and traditions, which was very interesting. All 3 lodges bring clear benefits to their local communities, so you can be confident that your tourist dollar is going towards helping them. It’s a simple way to travel responsibly and sustainably! One of the most affordable options – the standard 4D/3N tour costs $280 per person. Just a tad more expensive than Nicky Lodge: a 3D/2N package costs $194, while a 4D/3N one costs $291. The 4D/3N standard cabin package costs $1417 (double/triple occupancy) or $2126 (single occupancy) per person. A suite costs $1638 (double/triple occupancy) or $2456 (single occupancy). They now also operate a mid-market lodge, Napo Cultural Center, located in the Anangu Kichwa community. A 4D/3N package there costs $730 (double/triple occupancy) or $868 (single occupancy). 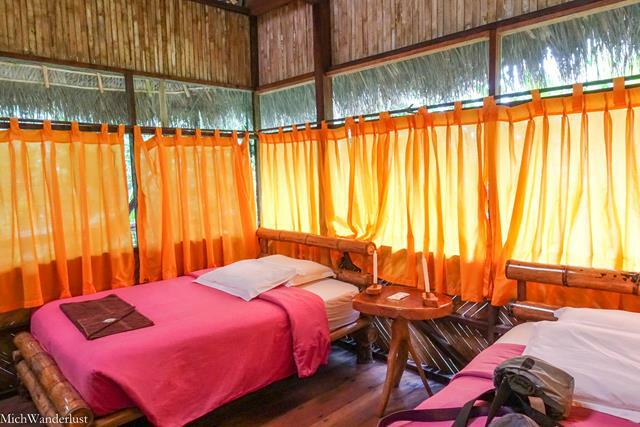 Nicky Lodge and Liana Lodge are among the more affordable jungle lodges, while Napo Wildlife Center lives up to its luxury lodge billing. 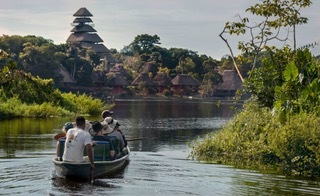 If you can afford it, Napo Wildlife Center looks like a fantastic place to experience the Amazon. Not only is it located in one of the world’s most biodiverse places – their approach to sustainable community tourism also makes it a great draw for the responsible traveller. Napo Cultural Center looks like a great mid-market alternative as it’s run by the same community. For those on a tighter budget, Liana Lodge and Nicky Lodge are both great options. Nicky Lodge is very popular and I’d recommend it if you want to see and learn as much as possible, and have at least 5 days to spare (taking into account travelling time). Liana Lodge, on the other hand, is ideal for those looking for a more chilled-out and flexible experience. Its other draws include easy accessibility, the chance to visit (and support) an animal rescue center, and relatively luxurious accommodation. Is visiting the Amazon on your bucket list? Which kind of lodge would you go for? 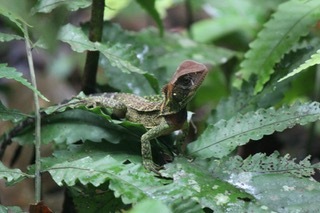 I’m grateful to Nicole for providing commentary on Napo Wildlife Center and beautiful photos from her stay! For more details on her experience there, check out her post over at Go Far Grow Close and her Instagram. Many thanks too to Napo Wildlife Center for providing promotional materials for reference. I’d love to spend some time in the Amazon. In all of the photos I’ve seen it just looks so lush and peaceful. Really enjoyed reading your tips and will have to keep them in mind for my next trip to South America! It’s an amazing place, although don’t expect it to be quiet – the noise from critters, especially at night, is surprisingly loud! It still retains a sense of peace, though. Glad you found it useful, and thanks for stopping by, Kay! We really love how you broke up the comparisons by section and gave both facts and opinions about the lodging options. Overall well organized post that we will come back to in the future whenever we make it there!! Thanks, you’re too kind! So glad you guys found this post helpful 🙂 Hope you make it there some day – it’s a really special place! Haha I’m glad you liked the spider picture, Tomas – I suspected it would freak people out or turn them off because I know some people don’t like spiders, but I do think it’s important to know what to expect. And so I’m glad that at least one person liked it! The yuca bread doesn’t have much taste on its own, we ate it with a variety of spreads (peanut butter, jam, etc.) and fillings (like salad). Thanks for stopping by! Can totally relate! I’m a lot cooler with spiders than I used to be. But I was really unprepared for the sheer size of the ones in the Amazon. It helps to be in a a tour group where nobody was freaking out, although I know some of them hated spiders. I’m just glad I didn’t see any snakes! Ok, those big a** spiders just totally turned me off from visiting, so whichever park doesnt have those would be for me haha Thanks for linking up with #TheWeeklyPostcard! Haha I can relate – I’m a lot cooler with spiders than I used to be, but was totally unprepared for the sheer size of the ones in the Amazon! 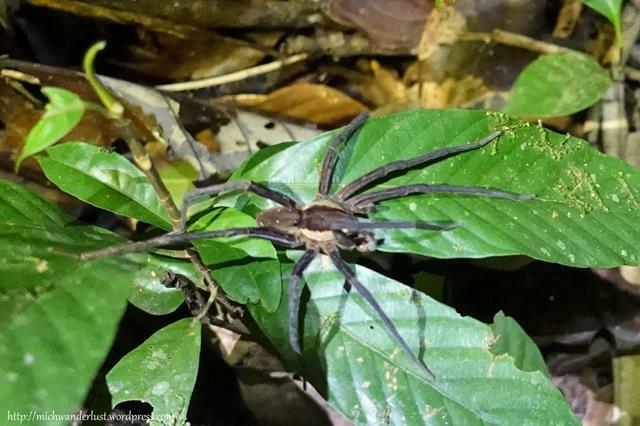 I realised there that there are a lot of creatures that I can’t stand more than spiders though 😉 And to be honest, I only saw them during the night jungle walks so I think it would be ok during the day haha. Thanks for stopping by, Lolo! Both places look and sound amazing. I am not the bravest when it comes to wildlife but this looks like it just might be worth it. I like the sound of Liana Lodge. A canoe ride in with a host of activities to keep you entertained. I love the sound of Liana Lodge which would be perfect as you could pick and choose. If I were with my husband and teenager, I would choose this one. If I were travelling solo and thus, “working,” I would choose Napo Wildlife Center in order to get the maximum, so that I could make a written feature out of it! Either way, they all sound great! In a perfect world, we wouldn’t have to pick just one, would we? 😉 I think whichever you choose, it would be a great experience. Thanks for your thoughtful comment, Victoria! Wow! These lodges are so perfect and astonishing. I wouldn’t know which one to choose. Thanks for the inspiration, Michelle! Glad you enjoyed the post, Agness. In a perfect world, we wouldn’t have to choose, right? 😉 Thanks for stopping by! Exploring the Amazon was one of my dreams many years ago, but lately my comfort zone is getting narrower. Both these lodges look amazing, considering how wild this place is. I may use your information later if I end up by visiting the Amazon jungle someday. Thank you for joining us for #TheWeeklyPostcard, Michelle. Great choices, for sure, but just being in the Amazon would be “over the top!” I do like the idea of the hammocks outside the rooms. That would be fun – assuming they come with mosquito netting, too. Thanks for sharing on #TheWeeklyPostcard! Now that you mention it, the hammocks I saw didn’t come with mosquito netting. Maybe it would be too claustrophobic? And strangely enough, I got bitten more at Liana Lodge than at Nicky Lodge, although I took the same precautions. Some things are just mysteries. Thanks for stopping by, Rob!